From the Saga Magazine archives: Head of Music Jeff Smith is the man who's chosen the tracks that we've been listening to for years. Here Eamonn Forde discovers the secrets of the playlist. In a quiet second-floor office tucked behind Broadcasting House in central London, the walls are lined with posters and silver discs for a variety of musicians – Pink Floyd, Amy Macdonald, AC/DC, Fleet Foxes, Robbie Williams, Marc Bolan, Rod Stewart and the Senseless Things (a barely remembered indie band from the early Nineties). Hanging in the corner is the sole indication of a life that is not completely devoted to music – an Everton scarf. Spotify is open on the computer on the desk, a stereo with piles of CDs sits to the left and just within reach is a book with a very simple but telling title, British Hit Singles. This is where Jeff Smith, now in his mid-fifties, decides not only what music is played on Radio 2 – by some distance the most popular radio station in the UK – but also on 6 Music, the BBC’s digital-only station that has a public service obligation to unearth the most exciting and innovative new music. 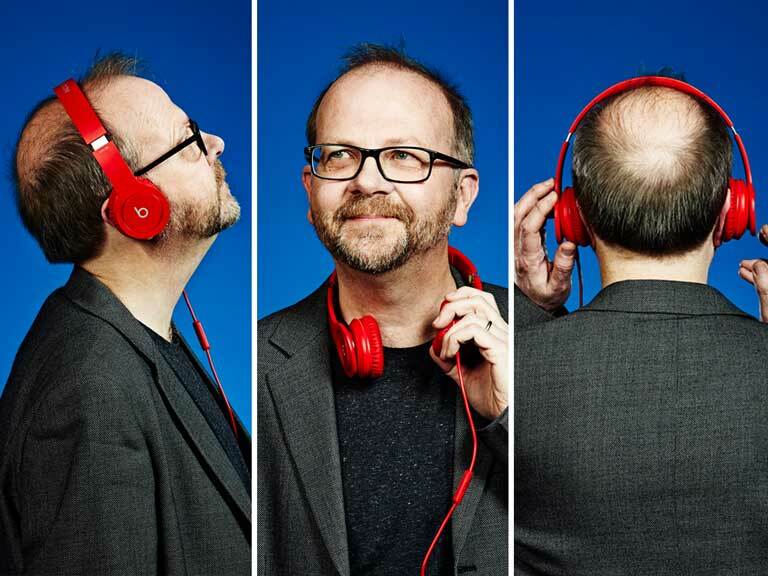 Wearing a black jumper, jeans, boots and glasses, with a few wisps of hair remaining atop his head, Smith is soft-spoken but is barely able to contain his buoyancy discussing the things he loves – music and radio. We met the morning after the Brit Awards: he’d spent half the night talking to Noel Gallagher, yet there are no discernible dark shadows under his eyes. Smith has the musical Midas touch: 6 Music’s audience has doubled to nearly two million since 2010 and in the final three months of 2013, Radio 2’s audience rose to an all-time high of 15.5 million weekly listeners. The average age of the Radio 2 audience is 51, but Jeff says it is currently seeing huge growth in listeners aged 65-plus. He has the task of finding music that appeals to perhaps the broadest radio demographic in the country. His audience wants a spread of new and old music – not to be left wallowing comfortably in nostalgia. Besides, nostalgia is going to be different for those aged 55 and those aged 70. Radio 2 aims to find music that suits all of them and introduce them to new artists who are not defined solely by their age. The sound of the station is defined and refined on a weekly basis at its crucial ‘playlist’ meeting every Wednesday. Here the producers of the station’s daytime shows pitch about 20 new songs from a list of around 70. In turn, each is assigned to the A (15-20 plays a week), B (7-10 plays) or C (2-5 plays) list. Each DJ’s show producer has an input. Exceptions can be made: for example, if a particular musician is a guest on a show, then more of their music will be played. But, in the main, Jeff and his team decide on 99% of what is played on Radio 2 during the daytime. An Engelbert Humperdinck and Cliff Richard duet was moved to the A list the week we met. At the same time, George Michael was added to the B list and new Dublin band PictureHouse made it to the C list – because the producer of Anneka Rice’s Saturday Breakfast show saw them live and liked them enough to argue persuasively for their inclusion. DJ Avicii was recently included because he used country music in one of his mixes and Daft Punk made the grade because they’ve been working with old favourites Chic. Equally, Katy Perry and Taylor Swift’s more pop-leaning songs will be in with a shout. Back in the Nineties, when he was a show producer at Radio 1, Jeff described his approach to music programming as ‘command and control’; the playlist committee would decide among themselves what music would make it onto air and the DJs ‘would just do what they were told and play what they were given’. Clearly, as head of music, Jeff has the power to make or break an artist. But the very set-up of the current committee – and his reputation as a straight-shooter – mitigates any attempt by a record label to influence or buy its way on to that list. Radio 2’s audience is not rigidly segmented into ‘buckets’ in the way that most demographic-based audience research tends to be (55-64 over here, 65-74 over there and so on). For Jeff, mood, not genre, is what defines a station – meaning it can freely jump across artists, genres and eras without feeling restricted by artificial parameters. Generational divides are crumbling as ‘middle youth’ is now stretching from your forties into your eighties. ‘People of my age have lived through it all and we can live with anything now!’ he laughs. He then moved into mobile discos with a friend, lugging their growing and eclectic record collection around in suitcases. ‘Something for all the family,’ he jokes, ‘which has helped with Radio 2, I can tell you.’ After building a rudimentary station at home – where his listenership’ was his mum and young sister – he went to college and over the years bounced around jobs at Piccadilly Radio in Manchester, the World Service in London, TFM Radio in Stockton-on-Tees and then to Radio 1 where, in the early Nineties, he and DJ Mark Goodier searched for new acts, sticking out like sore thumbs when the station was dominated by the likes of Simon Bates and Bruno Brookes. He defected to Capital Radio in 2000, then worked at music-streaming company Napster (a precursor to Spotify), returning to the BBC in 2007 as head of music for both Radio 2 and 6 Music. ‘What 6 does is keep me fresh,’ he explains. He migrates music from 6 Music to Radio 2 and is looking at how the Arctic Monkeys can be brought onto the station’s playlist. And in that memory he defines what his job today is and what it has always been – finding great music, trumpeting it to as many people as possible and taking pleasure from lifting someone’s day with a song that echoes down the years. Indulge your musical passion on a Jazz holiday.